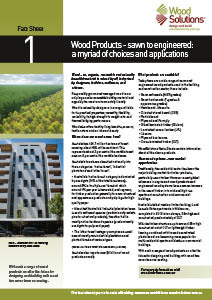 WoodSolutions Fact Sheets are concise, one page descriptions of timber products and their benefits, scroll down to view. 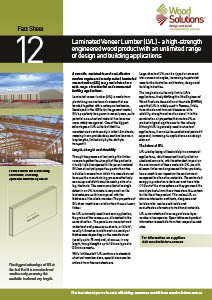 More information about the application and use of timber products can be found in the WoodSolutions Design Guides. Wood – an, organic, renewable and naturally beautiful material is valued by all, but prized by designers, builders, craftsmen, and artisans. Responsibly grown and managed wood is our only large scale renewable building material and arguably the most environmentally friendly. Wood is valued by designers in a range of fields for its practical properties; versatility, flexibility, workability, its high strength to weight ratio and thermal bridging performance. Wood also offers healthy living benefits, a warm, tactile nature and an inherent beauty. Taking naturally variable round logs and turning them into the multitude of beautiful and useful timber products people desire and use takes, experience, knowledge, skill, innovation - and passion! There are a several ways round logs can be sawn to maximise recovery and minimise waste while also providing a desired look or grade. This fact sheet looks at the three main options and the grading process. Renewable Australian hardwood is a tried and tested resource, highly valued in a wide range of structural and appearance grade applications. beautiful hardwood timbers in the world, and with such a wide range of species to chose from, there is plenty on offer. Sourced from both responsibly managed native forests and plantations, Australian structural hardwoods are used extensively throughout the building industry in a wide range of structural and appearance applications. This fact sheet discusses their applications. Structural softwood ticks all the boxes when it comes to strength, ease-of-use, and cost-effectiveness, plus it is renewable, responsibly sourced and has a low carbon footprint - what more could you ask for? Structural softwood is a readily available, easy to use and versatile timber. 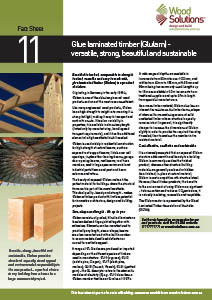 This fact sheet discusses some of the advantages, common sizes and environmental benefits of structural softwoods. Treating wood to improve its longevity or reduce maintenance is almost as old as the use of wood itself. Today, pine treated by one of a range of preservative processes is the material of choice for a wide range of internal and external applications. 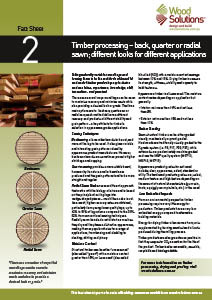 This fact sheet discusses the advantages of treated pine and explains some common treatments. Masonite hardboard has developed into a material that can’t be ignored as a sustainable source of strong, weatherproof panelling for extensive building applications. 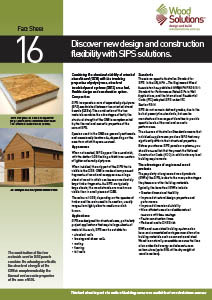 This fact sheet discusses the history and use of Masonite. 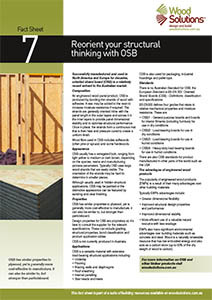 Successfully manufactured and used in North America and Europe for decades, oriented strand board (OSB) is a relatively recent entrant to the Australian market. This fact sheet discusses its composition, appearance, properties, applications, standards and advantages. Cost-effective, long lasting and easy to install; particleboard flooring is widely used in residential, commercial and industrial projects. 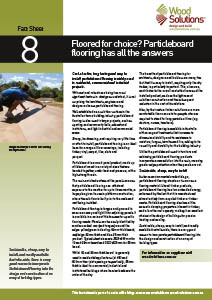 This fact sheet discuses common sizes, properties and use of particleboard flooring. Strength, durability, versatility and ease-of-use make structural plywood panels an ideal quality engineered material for many design or building projects. Plywood is the oldest of the engineered wood products, with archaeologists finding traces of laminated wood in the tombs of the Egyptian pharaohs. Today, plywood is one of the most widely used wood panel products available, utilised in a myriad of decorative and structural applications. 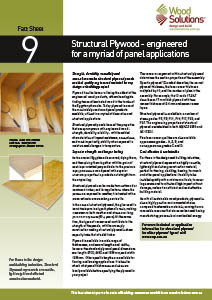 This fact sheet covers the properties, common sizes, grades and advantages of plywood. Reduce, re-use, recycle - formwork plywood, or formply as it has become known - meets all the criteria for a sustainable building material, with the added advantages of being waterproof, lightweight and easy to install. This fact sheet discussus the common sizes, applications and benefits of formply. Beautiful, comparable in strength to steel, versatile and easy to work with, glued laminated timber (Glulam) is a widely adaptable product. Originating in Germany in the early 1900’s, Glulam is one of the oldest engineered wood products and one of the most resource-efficient. 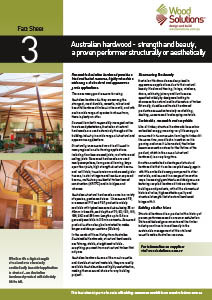 This fact sheet introduces the properties, applications and benefits of Glulam. A versatile, sustainable and cost-effective contemporary engineered wood product, laminated veneer lumber (LVL) is an excellent choice for a wide range of residential and commercial building applications. 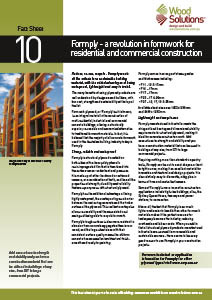 This fact sheet discusses its properties, uses and advantages. 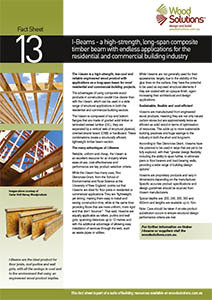 I-beams are a high-strength, low-cost and reliable engineered wood product with applications as a long-span beam for a wide range of residential and commercial building projects. 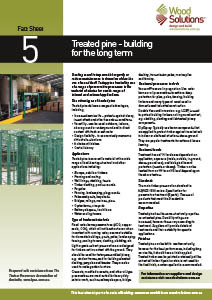 This fact sheet discusses their adantages, common sizes and typical applications. First developed in Switzerland in the 1970s, CLT is one of the most exciting and innovative engineered wood products. 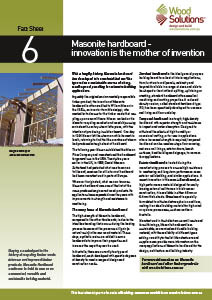 Its potential as a sustainable building material for mid-rise and higher projects, is rapidly being realised, in Australia and internationally. 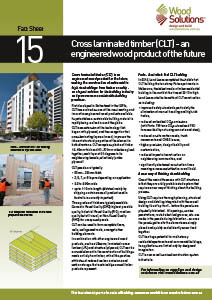 This fact sheet discusses some of the common sizes of CLT, its benefits and applications. Combining the structural stability of oriented strand board (OSB) with the insulating properties of polystyrene, structural insulated panel systems (SIPS) are a fast, flexible design and construction option. They are more common in European and overseas markets than in Australia. 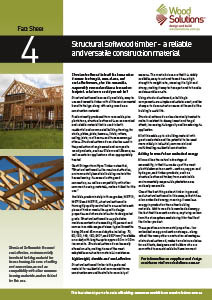 This fact sheet discusses their composition, appearance, applications, standards and advantages.